Marriage*: She married John MacNeil. Birth*: Isabel was born circa 1850 in Nova Scotia, Canada. Marriage*: He married Isabel MacNeil. Birth*: John was born in 1850 in Nova Scotia, Canada. Burial*: He was buried in MacDougall's Graveyard, Margaree, Inverness, Nova Scotia, Canada. [S709] Diocese of Antigonish, Nova Scotia, Canada , Baptismal record of Angus McPharlane, page 153. [S100] Obituaries from The Casket Newspaper, 1852 - present, Obituary of Angus MacFarlane, 39-1890-39-3. [S709] Diocese of Antigonish, Nova Scotia, Canada , Baptismal record of Donald McFarlane, page 63. [S709] Diocese of Antigonish, Nova Scotia, Canada , Marriage record of Angus P. McFarlane and Ann McIsaac, page 139. [S709] Diocese of Antigonish, Nova Scotia, Canada , Marriage record of Angus McFarlane and Mary McDonald, page 132. [S100] Obituaries from The Casket Newspaper, 1852 - present, Obituary of Angus McFarlane, 39-1890-39-3. Biography*: Donald was in school at the time of the 1881 census. Ancestry.com. Ontario, Canada, Deaths and Deaths Overseas, 1869-1946 [database on-line]. Lehi, UT, USA: Ancestry.com Operations, Inc., 2010. Year: 1911; Census Place: 6, Antigonish, Nova Scotia; Page: 2; Family No: 16. [S709] Diocese of Antigonish, Nova Scotia, Canada , Baptismal record of Sara Ann McPharlan, page 156. [S709] Diocese of Antigonish, Nova Scotia, Canada , Baptismal record of John Peter McPharlan, page 156. [S709] Diocese of Antigonish, Nova Scotia, Canada , Baptismal record of Mary Marcella McPharlan, page 157. [S709] Diocese of Antigonish, Nova Scotia, Canada , Baptismal record of Chrisy Bell McPharlan, page 157. [S709] Diocese of Antigonish, Nova Scotia, Canada , Baptismal record of Angus Peter McPharlan, page 158. [S709] Diocese of Antigonish, Nova Scotia, Canada , Marriage record of Majory McInnis & Dan McPharlan, page 164. [S709] Diocese of Antigonish, Nova Scotia, Canada , Marriage record of Dan McPharlan & Marjory McInnis, page 510. [S203] MacFARLANE-THIBIDAULT, January 30, 1941. Passed away on Feb. 18, 1957 at Caledonia, Ont. Marcella, widow of the late Daniel MacFarlane, daughter of the late John and Christina MacInnis of St. Andrew's Antigonish, N. S.
Leaves three sons, John P. of Morris, Man., Alexander of Argentia, Nfld. and Hugh of Calgary, Alberta. Four daughters, Christina (Mrs. W. A. Boyle) and Violet (Mrs. C. E. Stringle) of Hamilton, Ont., Marjorie (Mrs. W. P. Lynch) of Halifax, N. S. and Mona (Mrs. J. L. MacLean) of Caledonia, Ont. with whom she lived. A son Angus P., daughter Sadie (Mrs. J. P. MacLean), one infant son Cameron and daughter Jean predeceased her. [S100] Obituaries from The Casket Newspaper, 1852 - present, Obituary of Mrs. Daniel MacFarlane (Marcella) 105-1957-40-2. Died suddenly at his home in Keewatin, Ontario on December 2, 1955, his 57th birthday. Eldest son of Marcella (MacInnis) MacFarlane and the late Daniel MacFarlane formerly of Somers Road, Antigonish, NS. Born at St. Andrew's, Antigonish Co. he moved in early youth with his parents to Somers Road near Antigonish. In his teens began working as a telegraph operator with Canadian Pacific Railway in Ontario, advanced to Station Agent which he held at different points in Ontario and Manitoba until death. Survived by wife- Hertha Von Holtin-Rathlow of Saskatchewan, one son, Angus John, telegraph operator in his father's office. Mother- Mrs. Marcella MacFarlane of Caledonia, Ontario. Predeceased by his father, his twin sister Sadie (Mrs. J.P. MacLean) of Antigonish and by a little brother, Cameron and sister Jean who died in early childhood. Biography*: Angus was the eldest son. He moved in early youth with his parents to Somers Road near Antigonish. In his teens he began working as a telegraph operator with the Canadian Pacific Railway in Ontario, advanced to Station Agent which he held at different points in Ontario and Manitoba until death. He was in Saskatchewan in 1944. [S709] Diocese of Antigonish, Nova Scotia, Canada , Baptismal record of Catharine McPharlan, page 158. Name Variation: Christina Isabel MacFarlane was also known as Tena. Biography*: Mary was a school teacher in Wallacetown, Ontario at the time of her father's death in 1925. The death occurred suddenly at Morris, Manitoba, of John Peter MacFarlane, formerly of Antigonish County. Second son of Daniel and Marcella (MacInnis) MacFarlane, he was born at St. Andrews, and later moved with his parents to Brierly Brook. At an early age he entered the service of the Canadian National Railways and made a career with that company in Western Canada as telegrapher and station agent. Although a cardiac ailment forced his retirement in 1965, it did not prevent him from playing an active and leading role in the organization and promotion of the political, social and recreational life of his community. He held office, variously, as president and secretary-treasurer of such local organizations as the Lions Club, curling, horseshoe and golf clubs, and the stampede committee. He was a reporter for the Winnipeg Tribune and from his youth was member of the Knights of Columbus. He is survived by his wife Audrey; two brothers, Alex, of Margaretsville, Annapolis, N.S., and Hugh, of Vancouver; and four sisters: Christine (Mrs. Boyle), Violet (Mrs. Stringle), Mona (Mrs. MacLean) of Caledonia, Ontario; and Marjorie (Mrs. Lynch) of Halifax. Two brothers and two sisters predeceased him. Biography*: John Peter was the second son of Daniel and Marcella. He was born at St. Andrews and later moved with his parents to Brierly Brook. He held office, variously, as president and secretary-treasurer of such local organizations as the Lions Club, curling, horseshoe and golf clubs, and the stampede committee. He was a reporter for the Winnipeg Tribune and from his youth was a member of the Knights of Columbus. At the time of his father's death in 1925 he was a telegraph operator in Sprague, Manitoba. He was a CPR telegraph operator in Ontario. Lived at Savant Lake in 1941. He was a telegraph operator in Ontario in 1944. Mass celebrated at St. Ninian's for Alexander MacFarlane, 68, of Brierly Brook and formerly of Margaretville, who died at St. Martha's Hospital on Oct. 24, 1977. Burial was in the parish cemetery. He served with the Royal Canadian Air Force during WW II and was a member of Arras Branch Royal Canadian Legion. A member of Antigonish Highland Society and played with the pipe band. A construction electrician, he had worked lately at fort MacMurray in Alberta. Survived by daughter Jean (Mrs. Paul Jenkins) Halifax, brother Hugh in British Columbia and sisters Majorie (Mrs. Bill Lynch) Victoria; Christine (Mrs. Walter Boyle), Mona (Mrs. John MacLean) and Violet (Mrs. Clifford Stringle) all of Caledonia, Ontario. Biography*: Alex was living in Ontario in January 1944. Alexander served with the Royal Canadian Air Force during World War II and was a member of Arras Branch Royal Canadian Legion. He was a member of the Antigonish Highland Society and played with the pipe band. 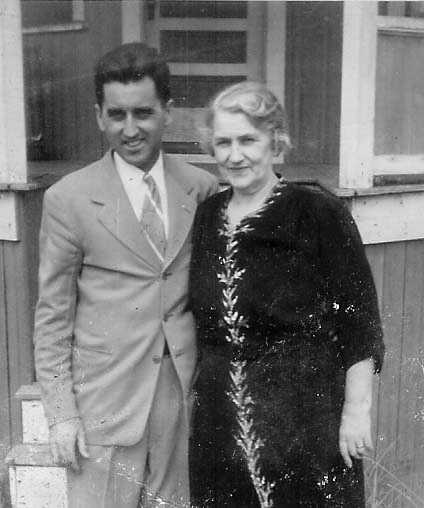 He was living in Antigonish at the time of his brother Angus Peter's death in 1955. Alexander was living in Argentia, Newfoundland at the time of his mother's death in 1957. He was living in Margaretville, Annapolis, Nova Scotia at the time of his brother John Peter's death in 1972. He was a construction electrician who had worked at Fort MacMurray, Alberta shortly before his death. [S1166] Robert MacLean, "0646 - Sarah Ann MacFarlane," e-mail to Donald James MacFarlane, September 19, 2018. [S793] Marilyn Stringle, "Williams, Marilyn to MacFarlane, Donald," e-mail to Donald James MacFarlane, March 23, 2013. [S799] Marilyn Stringle, "Violet MacFarlane ID# 0648," e-mail to Donald James MacFarlane, April 16, 2013. [S187] Mary MacFarlane Monument Inscription, Donald James MacFarlane, Meredith, Belknap, New Hampshire, USA. Married Name: As of circa 1880,her married name was MacGillivray. Religion*: Hannah Bell MacFarlane was Roman Catholic. Married Name: As of circa 1875,her married name was Carter. [S709] Diocese of Antigonish, Nova Scotia, Canada , Baptismal record of John Joseph Carter, page 145. [S709] Diocese of Antigonish, Nova Scotia, Canada , Marriage record of Hannah B. McFarlane and James Carter, page 133. Religion*: James Carter was Roman Catholic. Religion*: John Joseph Carter was Roman Catholic. Religion*: Dr. Peter MacFarlane Carter was Roman Catholic. Religion*: Catherine S. Carter was Roman Catholic.